Referred to as ‘the town with two summers’ because the subtropical weather, Phalaborwa is the ideal year round holiday destination. Situated in the picturesque north eastern Lowveld, Phalaborwa is the Sotho word for ‘better than the south’. Phalaborwa experiences high summer temperatures, with a daily average temperature being 31 degrees Celsius. The rest of the year experiences comfortable and pleasant weather, with warm days and cool nights. There is an average annual rainfall of about 450mm. The rainy season starts in September and lasts until April. In winter there is little or no rain. The climate is predominantly subtropical. Winters are very mild and frost-free. The area is well known for its high summer temperatures experienced during November, December, January and February. 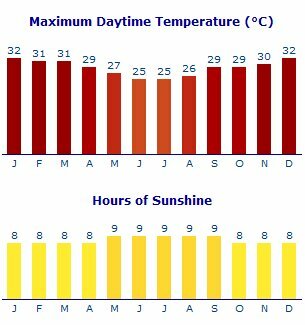 The average daily summer temperature is 31 degrees celcius and the average daily maximum summer temperature is 32 degrees celsius. During the rest of the year a comfortable climate predominates, with moderate warm days and cool nights. The average daily temperature is 26 degrees C and the average daily minimum winter temperature is 8 degrees C.
The average yearly rainfall is about 450mm. The rain season starts during September and lasts up to April and it is followed by winter, which is a period of very little or no rain. The prevailing winds are north-east throughout the year. The winds are easterly during the summer months and south-westerly during winter. Any time of year is a good time to visit Phalaborwa, as each season has its own advantages.